The most highly coveted of ornamental plants, the delicate, exotic and graceful Phalaenopsis orchid represents love, luxury, beauty and strength. Simply presented in a clear glass cylinder it adds a natural elegance to any environment. 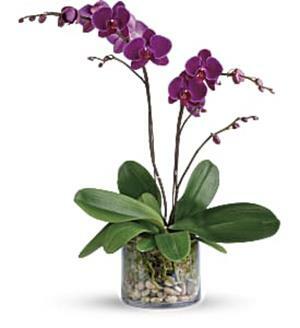 A purple phalaenopsis orchid is arranged with natural river rocks and sheet moss. Delivered in a clear cylinder vase. Approximately 22 W x 26 H Flowers and container used subject to availability and season. Some substitutes may be necessary.